Spoiler: There are links for recipes below. One is for a fabulous vegetarian sandwich and the other my faux pho soup. I’d been buying sprouts at the grocery store for better than than 20 years thanks to a fabulous sandwich recipe I’ve been enjoying, but it never occurred to me that I could grow my own. I bought a sprouting cup, sprouted some wheat berries, and offered them to my parrots. They wouldn’t touch them. So I nibbled on the sprouts myself and put the cup away for a few years. Then came our first winter with chickens on board. I wanted to provide them with some sort of nutritious greens since there was nothing left out back for them to forage. I started with wheat berries, since I already knew they loved wheatgrass. It was an instant hit! Next I tried mung beans, the beans that make the Chinese bean sprouts you buy at the store. They loved them too–and so did I! 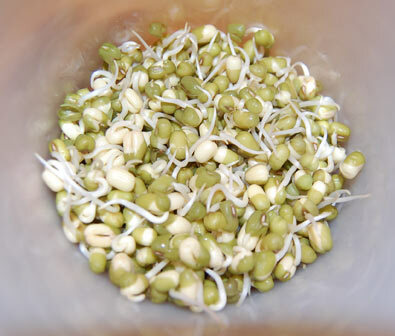 I realized that I could sprout mung beans for my own home cooked Asian dishes and not have to settle for pale, lifeless and often slimy sprouts sold at grocery stores. We love sunflower seeds in our salads, and I thought sprouted sunflower seeds would be even better. I buy shelled raw sunflower seeds for my homemade bird food mixes and thought they wouldn’t sprout as they were shelled and possibly damaged. Not so! They sprouted beautifully and we had another winner! Just today I decided that I needed to have more than one sprouting container going at once, so I could have continuous sprouts available. I ordered two more sprouting cups, the Easy Sprout Sprouter, from Amazon.com, plus some broccoli seeds because I’ve heard so many amazing things about them, such as this article Broccoli Sprouts Fight Cancer by Dr. Mercola. So… what’s involved? I’ve been buying wheat berries and mung beans in the bulk foods aisle at Wholefoods. I’ve seen some health food stores selling small packets of these items for outrageously high prices and am constantly amazed that people buy them. You can buy wheat berries, mung beans, raw shelled sunflower seeds, etc. in the bulk aisles of many health food stores for just about nothing. Look there first! 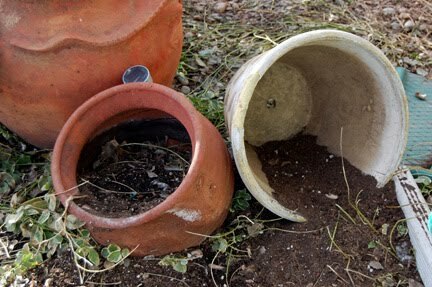 You need something to sprout your seeds/beans in. 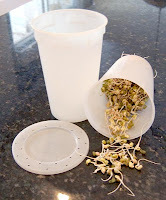 I chose the sprouting cup because at the time it was all I could find. After viewing what Amazon has to offer, there are many, many more options out there today. But for this post, I’ll stick to what I know. The white food grade plastic sprouting cup holds about 4 cups of content. There’s an outer cup and an inner one that has drainage holes in the bottom. It comes with an extra bottom with smaller drain holes that fits in the inner cup (in case you’re sprouting really small seeds), a dome and two flat covers — one solid, one with breathing holes. Oh, and a guide that gives a LOT of specific information on how to use the cup. 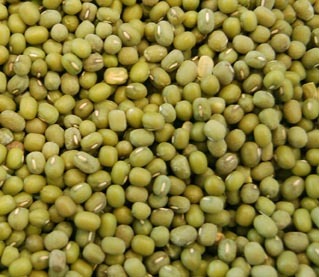 I’ll use mung beans here for my example. On day 1, I put about 1/3 cup of mung beans into the coupled cups and add some filtered water (twice as deep as the beans), add a lid and let them soak over night in a cool, dark place (my kitchen counter works fine). Next morning, I lift the inner cup out of the outer cup, dump the greenish water, and rinse the beans well with fresh filtered water. Later in the day I rinse again. By this point they’re already soft and starting to sprout! 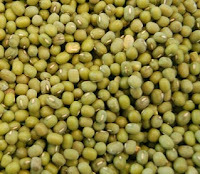 You can munch on them at any time, but with the mung beans you may also want to keep them growing until they’re a couple of inches long so you can use them in recipes, such as my Faux Pho. I rinse and drain 1-2 times every day until the beans are being eaten because it’s so dry here in Colorado. 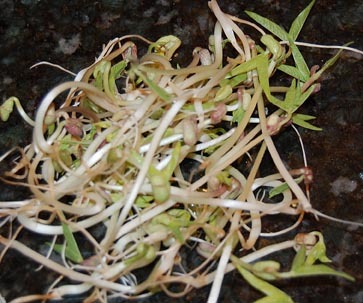 Keep a close eye on the freshness of your sprouts — you don’t want them to get moldy and smelly. Keeping them rinsed and drained, and at a reasonable temperature, keeps them fresh and healthy. Once they grow to the size you want, you’ll want to put them in the fridge so they don’t get moldy. I’ll update this post with my broccoli sprout experience some time in the future. For extensive information on sprouting, and to purchase just about anything related to sprouting, visit this web site http://sproutpeople.org/. They know EVERYTHING about sprouts! 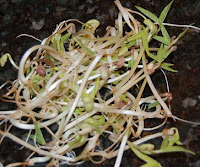 This entry was posted in mung bean sprouts, original recipes, pho recipe, recipes using sprouts, sprouting beans, sprouts, urban farming on February 18, 2012 by Farmer Deb. 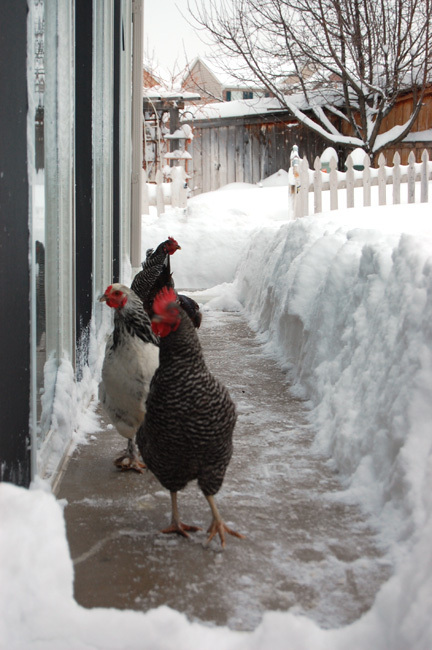 What it’s really like to have urban chickens – Part 3 – Fully grown chickens, very cold short days ahead and snow! 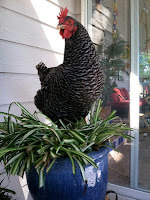 Spoiler: A link to my recipe for Organic Chicken Feed can be found below. Unfortunately, at least for me, summer doesn’t last forever. Our chickens spent the summer and fall foraging in our back yard for whatever greens and proteins they could find, plus the treats we’d give them during the day. They had their pellets available too, but preferred fresh food. Before long, the greens were no longer available and so I started supplementing even more with dandelion greens, spinach, salad and other greens from the grocery store. I asked King Soopers if they’d let me have the greens they were going to throw out because they were past their prime, and they said by law they could not. So I buy marked down salads when I can or give the girls green stuff from our fridge that’s on it’s way out. Since our garden was done for the season, I opened the gate and the girls got to finish up the things they didn’t like when times were good—celery stalks and leaves, collards and broccoli stems. 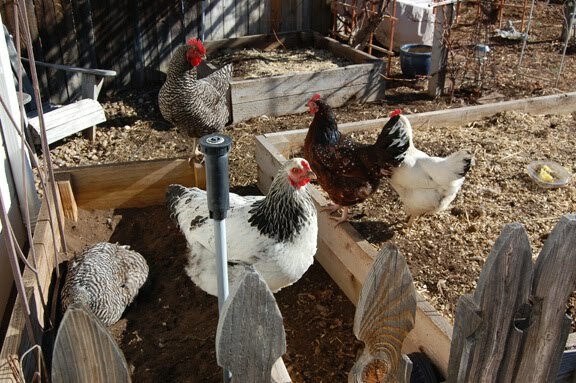 They take dirt baths in our raised beds and rototill compost into the garden beds. 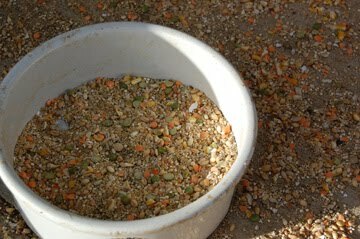 I found a great recipe for homemade chicken feed that is too expensive to feed exclusively to the girls, but makes me feel great that I can give them healthy grains in addition to their pellets. And they absolutely LOVE it! So their diet right now is organic chicken pellets, a cup or two of my homemade feed daily, extra treats of greens and food scraps, and some sort of calcium-rich grit such as oyster shells or recycled crushed egg shells. We decided that before it got too late in the season we needed to plan for REALLY cold weather. 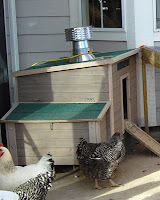 My husband cut a hole in the roof of the chicken coop in order to attach the old heat lamp and a “chimney”. An article I read said that hay was a better insulator than pine shavings, so just before the days got short and nights were cold, I added a layer of straw under the pine shavings. 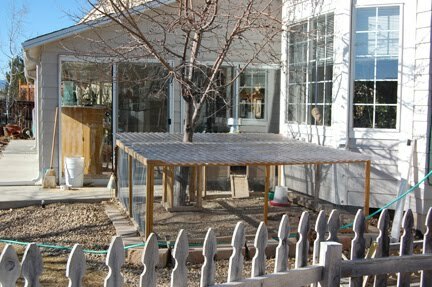 Now, for those of you who want to know how hard it is to keep a chicken coop clean, I can honestly say that it depends on how many chickens you own. We have five. Two to three times a week I put on some waterproof gloves, roll back the coop (we put wheels on the legs), scoop the poop out and toss it into our compost bin. If needed, I add more bedding. The whole process takes about 10 minutes. 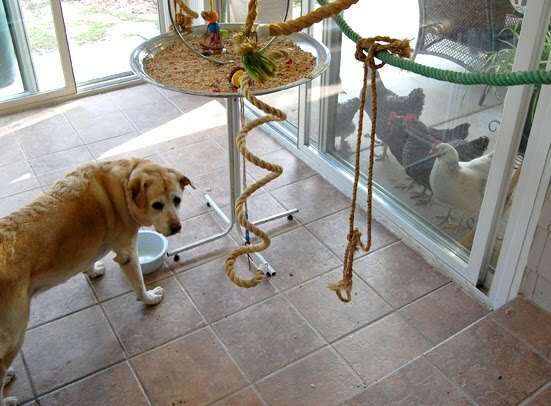 Some of my chickens like to watch and make comments as I clean. Easy work. I don’t usually have to clean the chicken run because they don’t spend much time there. They poop on the lawn and either our sprinklers in the summer or snow and rain the rest of the year melt it into the grass. The first time we went on vacation AC (after chickens), we paid a friend’s daughter come to our house twice a day to let the girls out, check food and water and put them to bed. By our second vacation she wasn’t interested. We didn’t know anyone else who could do that for us, so we ended up hiring a house sitter. It’s more costly, but if you own a house it’s comforting for many reasons, plus our dog was able to stay home too. 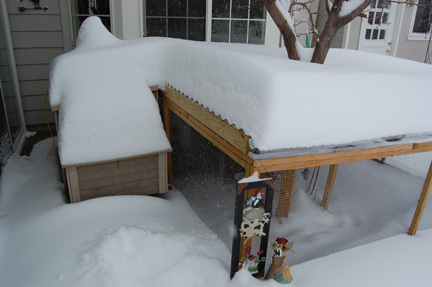 We had a couple of snow storms in October 2011, and although the coop was snow tight the chicken run was half filled with the white stuff. At one point I bought a clear tarp and thumb-tacked it over the run’s roof to keep the weather out. But we have some pretty incredible winds here, and after a couple of months it started to tear and break loose. My husband went to Home Depot and bought some clear corrugated plastic panels. He trimmed them to fit over the chicken run, and for the most part it works well. He angled the sheets on one side so snow (and rain) would drain off and away from the run. We turn on the heat lamp on nights where it got below zero degrees and it seems to work just fine for the girls. If the temperatures get below -10, I can always bring them back into our sun room in the play pen. A recent snow storm told us that the corrugated plastic roof would not always be enough protection. The storm lasted two days and dumped 2 feet of snow in our yard. 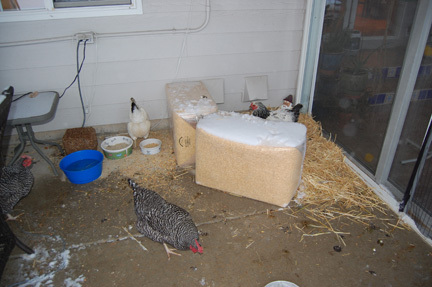 Winds whipped the snow around the south side of our house—and right into the chicken run. So… maybe we need to cover the south side of the run with something, at least in the winter. Now for the not-so-pretty stuff: When the weather is bad the chickens poop all over our patio. I sweep after them every day. If it gets warm enough, I hose off the patio. I’ve had to remove the cushions from of our patio furniture to keep the chickens off. And oh, did I mention that chickens poop a LOT? When the snow melts off the yard they spend their days looking for things to eat in the yard and forget about the patio. But there have been a few days where that’s been impossible and they make a real mess out of our concrete. And sometimes the poop gets smashed down and freezes—there’s no way to get that cleaned off until the weather gives us a break. Luckily we live in Colorado and we get patches of nice weather between snow and cold. If we lived somewhere where the entire winter is a frozen mass of snow, I wouldn’t be able to deal with having chickens in the ‘burbs. 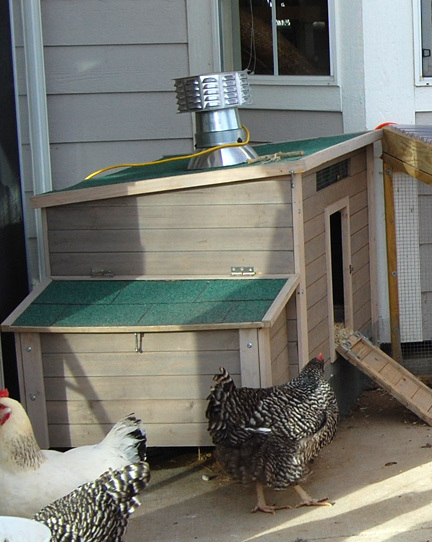 They would need a large chicken run and coop or barn. Abby won’t share like they do. The girls still want to come inside. Every chance they get, they sneak in and I find one sitting on a papasan chair making little “boop boop boo” sounds. One day I was sitting at our kitchen island working on my laptop and heard a soft sound next to me, near the floor. I looked down and there was Jenny, standing next to my chair and looking up at my face. I pick up one or another chicken every few days and take them on a tour of the house. They seem to enjoy it. Chickens are a lot smarter than I expected. They make a lot of different sounds and I’m learning what some of them mean. They have personalities! Jenny is extremely sweet but the absolute bottom of the pecking order. Duck is very smart and very vocal. She’s always the first one who sees our lights go on in the morning and starts yelling to be let out of the run. She’s also the one who comes to our sunroom door and loudly demands food. Flopsy and Mopsy are fairly friendly and quiet and are the ones who will jump up and sit in our laps. Tiggy is standoffish but melts when I “force” her to sit on my lap and endure snuggling and petting. She seems embarrassed about that. A few of my aprons. In early fall Denver had it’s first county fair. 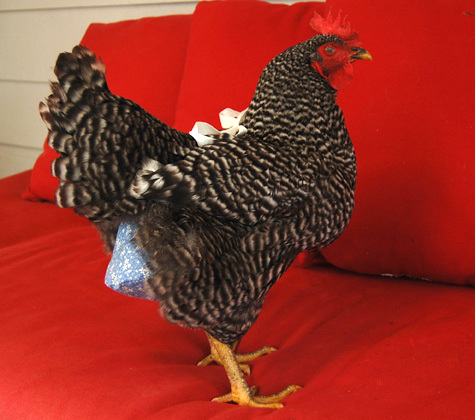 I had seen chicken diapers in a magazine and mentioned them to a friend who is not only a seamstress but also owns chickens. She rented a booth at the fair to sell aprons and asked if I would like to sell chicken diapers. Sure, why not? I ordered a couple from web sites and was not impressed with their construction or fit, so I came up with my own design and made a few. 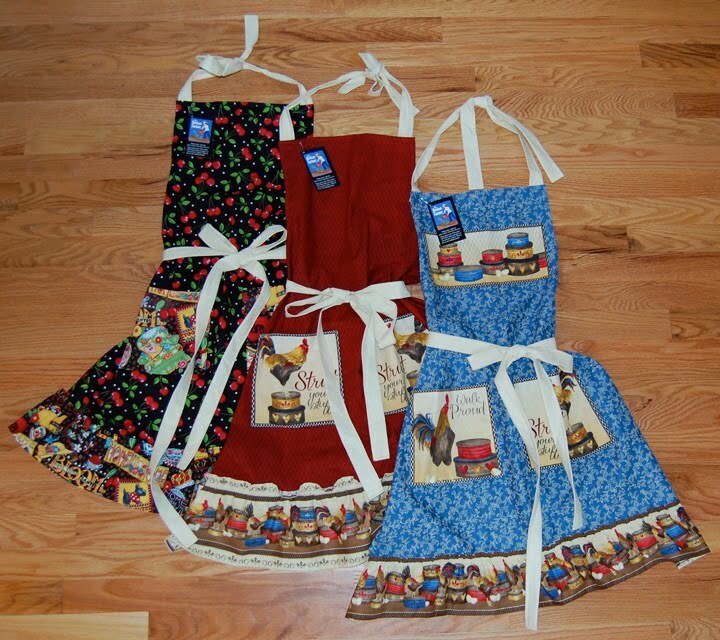 I also made some chicken-themed aprons to match, and joined my friend at the fair. You can check out some of my designs here. Eventually I’ll get them on Etsy. 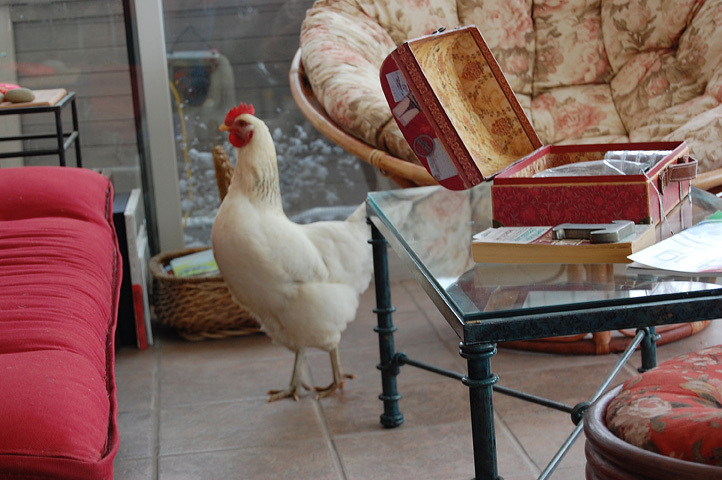 You just never know when one of your chickens is injured or sick and needs to spend some time indoors. Did I mention they poop a LOT? It’s now February and I think we have winter figured out. The girls don’t lay as many eggs—three of them are moulting which happens after they stop producing eggs for the winter. They still aren’t crazy about snow. Their egg shells are getting thinner, so I’m recirculating their eggs shells into their food (mentioned above). I dry out the egg shells and pulverize them in a baggy so they don’t really know what they are— I don’t want to give them any ideas. We’re just a couple of weeks from the date they came to live with us. 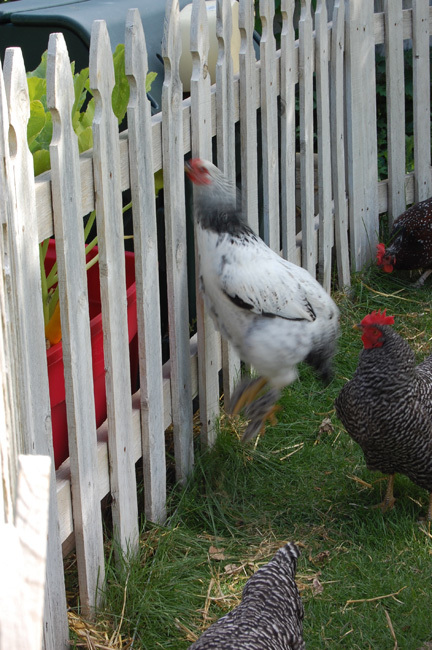 They seem happy, and we still love having the cheerful clucking little girls in our yard. One of the hardest things about keeping chickens, at least the way we do, is that they don’t have the yard to roam when there’s a lot of snow and so spend a lot of time on our patio pooping and demanding food. I keep giving them as many greens as I can to make up for the lack of foraging, in the way of spinach, salad, greens and sprouted wheatgrass. They get great leftovers: Last night it was spinach souffle and leftover fresh trout scraps with the bones removed. My animals eat better than a lot of our neighbors’ kids. If you want to feel loved and appreciated, just get a flock of chickens that run full speed to you when you walk outside. Never mind that they’re expecting food, they look so funny when they run! We’ve been hearing coyotes on the other side of our fence lately—I hope they only come by at night, when the girls are protected by our construction. Our girls are part of our family and we want to keep it that way as long as we can. Despite the mess, the extra work and the shortage of eggs lately, I still love the little sweeties and am glad we have them. For my conclusion, what’s it really like to have chickens in the ‘burbs? 1. They are really cute! They are quirky, funny, have personalities, look pretty and make fun sounds. Very entertaining—they make us laugh, A LOT. 2. They are the only pets that give you food in return for your efforts. 3. They eat weeds, insects and mice. BC (before chickens) our back yard was overrun with dandelions. Now our neighbors give us dandelions from their yards to feed to our chickens. 4. There is something very grounding and relaxing about spending time with chickens. I get such a warm happy feeling when hugging a chicken. 5. They mow and thatch your lawn and fertilize it at the same time. 6. They produce high quality fertilizer for all your other gardening needs. 7. They will love you if you are nice to them. 1. They are extra work—but not much. 2. They are an extra expense: food and housing. 3. They poop a lot, so cleanup is involved. And an odor if you don’t clean up often enough. But… See #6 above. 4. They also eat all of your plants, so exposed gardens and flower pots are out of question. I just ordered a book from Amazon about having a nice yard AND chickens. I’ll update with a post of what I learn. So, urban chickens? It depends on what you’re looking for, what type of pet owner you are and how much time you have for a few extra chores. For me? It’s a win-win situation. I LOVE my chickens! This entry was posted in chickens in the suburbs, pet chickens, urban chickens, what are chickens like as pets on February 9, 2012 by Farmer Deb.